Gerry Penalosa (right) and Carl Jammes Martin. There’s a 19-year-old Ifugao fighter who could be the next Manny Pacquiao and WBO No. 10 bantamweight Carl Jammes Martin will try to live up to the billing when he makes his Metro Manila debut against Thai veteran Petchchorhae Kokiet-Gym at the SM City North EDSA Skydome on Feb. 16. 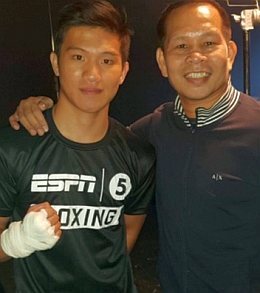 Former two-time world champion Gerry Penalosa is giving Martin a push in his career after his father Abel, a retired Army private first class, asked for help. Penalosa is promoting the card on Saturday. It was Martin’s older brother Abel, Jr. who sought out Penalosa last year, requesting for boxing equipment after Typhoon Rosita devastated the gym where he trains in Lagawe. Penalosa donated three pairs of boxing shoes and two heavy bags. That started a relationship between Penalosa and Martin. “The kid has charisma,” said Penalosa. “He’s not hard to talk to. Carl is explosive and left-handed. He reminds me of Manny and has tremendous power. What he lacks is experience. We won’t rush him. We’ll test him and bring him up slowly. By next year, he could be ready for a world title shot.” Penalosa recently introduced Martin to Ever Bilena CEO Dioceldo Sy who has included the fighter in the stable of athletes he is supporting. Other Ever Bilena athletes are swimmer Jasmine Alkhaldi and tennis prodigy Manolo Angara. Martin was recently cited by The Ring Magazine as one of five Filipino prospects under the category “Keep An Eye On.” His record is 11-0, with 10 KOs and his last five opponents were foreigners from China, Indonesia, Thailand, Tanzania and South Korea. Martin started boxing when he was six and climbed the ring for his first official amateur bout a year later. He compiled a 56-0 record as a simon-pure and has never been floored nor stopped in the amateurs or pros. The only pro to go the distance with Martin was Jason Buenaobra who lost an eight-round decision in 2017. Martin said he just recovered from illness and was not at full strength. But he decked Buenaobra in the second round on the way to a clear-cut verdict. Martin used to wear handwraps improvised from diapers and cloth of flour sacks. Johnny Elorde’s son Nico, a PBA player, gave him genuine boxing handwraps last year. And only once has he received a purse. His father has promoted all his fights so whatever he should’ve earned went to defray expenses. The only exception was when he fought in Bayombong last August and was given a P150,000 purse. But Martin pocketed only P5,000 as the rest was used to pay off his father’s debts from unprofitable boxing promotions. One of seven children, Martin is in Grade 12 at Riverview Polytechnic and Academic, Inc. in Ifugao. His older sister Jing, 27, handles his business affairs on a full-time basis. His father Abel is his trainer and his mother Ermilinda was formerly secretary of the mayor of Banawe. Abel was the only survivor from a platoon of 17 ambushed by the NPA in Ifugao in 1984. Before he enlisted, Abel boxed as a pro briefly and was trained by Tony Jumao-as. Martin said he grew up idolizing Pacquiao, Penalosa and Z Gorres. Boxing has been in his blood since he was a kid and although Ifugao is known to produce MMA fighters, the ring----not the octagon----is where he wants to make a name for himself. His cousin Stephen Loman is an MMA fighter and ONE bantamweight champion Kevin Belingon is from the next town. A few weeks back, Martin visited the Survival Gym in Magallanes, Cavite, and engaged IBF superflyweight titlist Jerwin Ancajas in a four-round sparring session. He more than held his own against Ancajas and said he learned a lot from the champion. Martin’s next opponent Petchchorhae has a 17-2 record, with 8 KOs and is also a southpaw. One of his KO victims was Filipino Roilo Golez. He was recently stopped by Filipino Giemel Magramo in the third round. Whether Martin’s for real or not will be found out on Saturday.